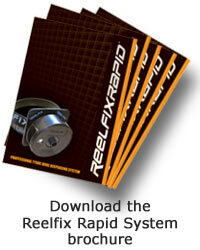 The Reelfix system is now available to purchase from our online shop. For larger orders please visit out distributors page or contact us with project requirements for a direct quote. We offer a next day delivery service to most UK locations and a 2-3 day service to Scottish highlands and Ireland. Copyright © 2018 Reelfix Construction Products Ltd. All rights reserved.